Are you or a loved one impacted by the effects of hearing loss? Hearing is a core sense that keeps us alert, active, and interacting with others. If left untreated, simple things like engaging in conversation with friends or talking on the phone can be hard. Not only can hearing loss negatively affect our communication, it can also lead to other health problems. Research shows that untreated hearing loss may lead to negative physical, social, and emotional health effects, reaching far beyond just hearing. These health effects seriously alter our overall professional and personal lives. Knowing the consequences of untreated hearing loss is the first step in the right direction towards taking care of our hearing health. Hearing loss isn’t just about the inability to hear. Studies have linked hearing loss to social isolation and depression. You may find yourself not wanting to be with people as much as before, and when you do make yourself go out, you tend to disengage from conversation. When you can’t follow what’s been said, and are worried about responding inappropriately, it’s little wonder that hearing loss can lead to social isolation and depression. A 2017 National Institute of Deafness and Other communication Disorders (NIDCD) study found that more than 11% of people with hearing loss also suffered from depression. “We found a significant association between hearing impairment and moderate to severe depression,” said Dr. Li, a researcher at NIDCD, and the author of the study. 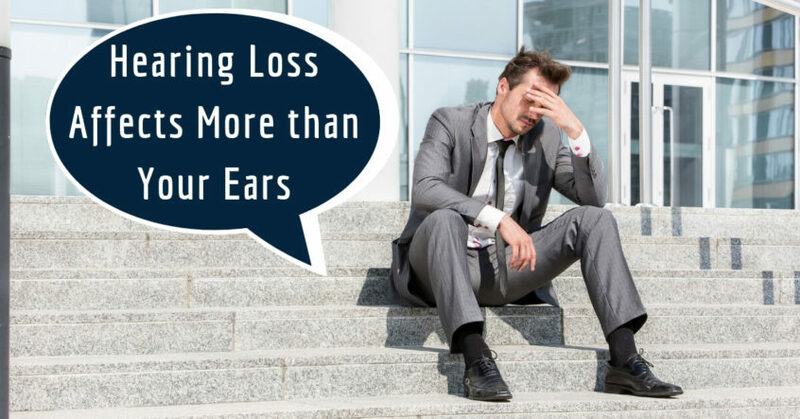 Other social consequences of untreated hearing loss include: problems communicating with your spouse, friends or relatives, communication problems in the workplace, lack of concentration, and an inability to focus on tasks. Not only is untreated hearing loss linked to social isolation and depression, it is also linked to a higher risk of falls and accidents, according to the American Association of Retired Persons (AARP). Professor Bhattacharya of Harvard Medical School points out the simple link to understand this. If you are unable to hear well, for example, you lose the crucial warning systems that notify you a car or truck is driving up behind you. Furthermore, hearing loss mutes the signals your ears pick up to help with balance, leading to more falls. In addition to just the impact of falling or being in accidents due to untreated hearing loss, other physical health concerns include: tiredness and exhaustion, headaches, increased stress, and eating or sleeping problems. Those suffering from hearing loss not only show signs of negative social and physical well-being, but may suffer the psychological impacts as well. Many people associate hearing loss to being old, and therefore do not seek out the proper professional treatment before it’s too late. Studies have shown that hearing loss often goes untreated for up to 7 years! The psychological consequences result in shame, guilt, anger, and anxiety. Those who have untreated hearing loss may even be extremely self-critical and possess a very low sense of self-esteem or self-confidence. Hearing loss doesn’t need to lead to other health complications. In fact, hearing loss is quite preventable, but the first step is acknowledging the problem and overcoming the stigma. It is important to admit your hearing loss and see a specialist as soon as possible to establish your next steps. Move beyond the idea that wearing a hearing aid will label you as incapable or disabled. Support is important, so don’t isolate yourself. Try to seek out support groups for people who suffer from hearing loss. Speak with your family and friends about your hearing loss and let them know that you may have a hard time hearing conversations over the phone and in crowded areas. The more you disclose your situation, the more people will accommodate you, and you won’t need to feel embarrassed. Disclose your hearing loss to your employer to avoid any type of work-related issues due to hearing loss. Research shows that those who identify their hearing loss and get treatment avoid issues within the workplace. And perhaps the most important step is to go for regular check-ups with your hearing specialist. By taking this first step, you avoid letting go of your social circles and hobbies because of hearing loss. Schedule a Hearing Test with Hearing Aid Associates Today! One of our hearing health specialists can help to improve your quality of life!